Premium quality bath mats size 20x30 weight 7Lbs/doz. These bath mats are thick and absorbent at wholesale price. Bright white and long lasting. Who wants to step out of the shower onto a cold or slippery floor? Order premium bath mats from Towel Super Center and protect your customers’ feet from cold and slips. Our 100-percent cotton bath mats come in bright white and perfectly match every décor item. Our premium bath mats are designed to stand up to frequent washes while maintaining their shape and softness — and that means saving money. Welcome to Towel Super Center, where finding discount prices on high-quality bath mats is easy. 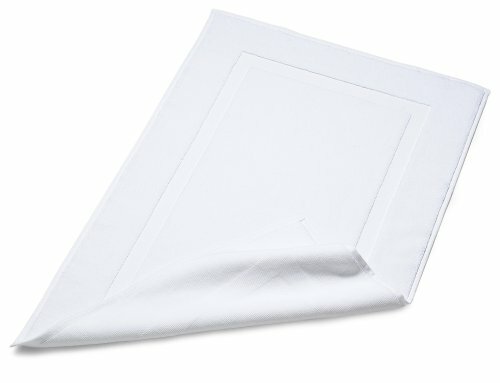 Generous 20x30 sizing: An ideal size for the shower and sink area, our bath mats work for hotels, spas, salons and more! Quality construction: These towels keep their size and shape, wash after wash, meaning you won’t have to replace your linens as often. Fast, low-cost shipping: Order online from Towel Super Center and you’ll have a dozen bath mats at your door in no time! Tip #1: Clean after each use. This prevents moisture from staying in the cotton fibers and creating a place for germs and odors to grow. Cotton is incredibly breathable, but when wet bath mats remain on the floor, the fibers cannot circulate air. Tip #2: Spot-treat any stains. One of cotton's most appealing traits is its ease in releasing stains. You can help this process along by spot-treating any marks before you launder your bath mats. Tip #3: Go easy on the bleach. Though it might seem natural to reach for the bleach to clean your white bath mats, go easy on it. Bleach is a harsh chemical and can make cotton less dense and fluffy. Many bleach alternatives are just as effective, especially when paired with a spot treatment product. Tip #4: Avoid using liquid fabric softener. Although liquid fabric softener will leave your white bath mats feeling very smooth and soft, it may cover them with an invisible layer of residue making them less absorbent. A better solution? Throw in a couple of dryer balls with your towels. Tip #5: Fold or use bath mats immediately after fluffing in the dryer. For best use, always take your bath mats out of the dryer while they're still warm. You can provide customers with heated bath mats under their feet or fold them for future use. Maintain the appearance your business wants and give your clients the peace of mind that they've made the right choice in coming to you. Order your favorite premium white bath mats today!